Jota Leal is an amazing fine artist, painter and caricaturist. He has a style that can stand on its own and it's pleasure to see his portraits. About Face is a 80-page hardcover the collects Jota Leal's portrait paintings. The art is breathtaking. There's the caricature style that distorts the features and there's also the realism behind the brush strokes. The skin textures or even the sweat beads look so convincing, as if the character has life. Many of the figures are of movie stars and singers, such as the Rolling Stone, Elvis, Jack Nicholson, Michael Jordan, Walken. There are also other characters like Bazooka Betty, Dali, Joker, Godfather and many others I do not know. Some paintings are drawn in the old masters style of chiaroscuro while others are more textural. The way the light and shadow is handled is fantastic. 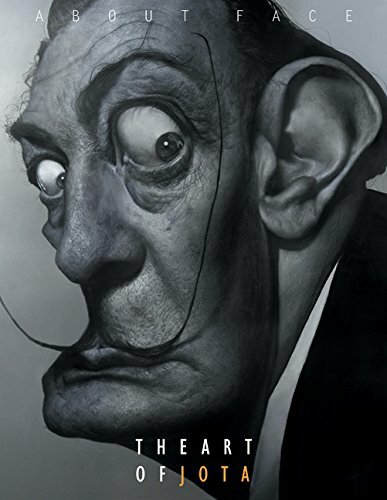 I mean, just look at the Dali painting on the cover. The only downside of the book is it left out the sizes of the paintings. It would be awesome to see the original paintings in person when they are already so good in the book. This is a fantastic artbook.